A new iconic attraction will be coming to Downtown Disney this summer. 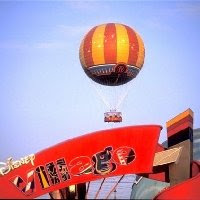 It is a tethered hot air balloon from the Aerophile corporation that will take guests 300 feet into the air for a panoramic view of Disney World. Downtown Disney® in Lake Buena Vista, Fla., will get its own iconic attraction, in the form of a giant tethered balloon that will take guests 300 feet into the air to view the vistas of Walt Disney World® Resort starting next spring. The balloon will give visitors keen for thrills the chance to ascend to the skies above Downtown Disney® for a six-minute trip, by day or night. It will give up to 30 guests at a time an unparalleled, 360-degree view of up to 10 miles. The balloon is the newest and largest of the company's Aero30 model, with a volume of 210,000 cubic feet, a 72-foot diameter, a circumference of 240 feet, and a height of 105 feet. It has a quick 8 points mooring system and a landing platform on the lake designed especially for Downtown Disney®. Aerophile has worked with Disney previously, providing a similar attraction for Disneyland Paris in 2005. This will definitely provide a new exciting feature for Downtown Disney. 0 comments to "Exciting New Attraction Coming to Downtown Disney Soon"